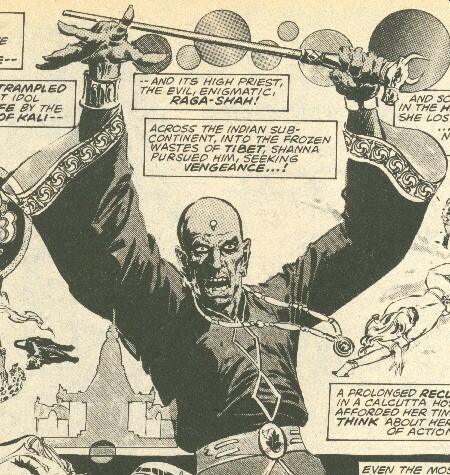 Powers/Abilities: Raga-Shah possesses limited magical abilities, enabling him to draw souls from other beings (at least animals) and use them to animate certain statues. He is reasonably strong and experienced with a sword. He has legions of fervent followers. (Savage Tales I#9 (fb)) - Raga-Shah was a professor at a university in Calcutta, where he met and entranced the young Sarapha Singh. She fell victim to his seduction and she soon promised to marry him despite her family's objections. (Savage Tales I#9 (fb)) - At some point Sarapha learned of Raga-Shah's true goal--the death of the entire world, as the ultimate sacrifice to K�li; Raga-Shah and his followers believed that K�li would bring them back in the next life. (Savage Tales I#9 (fb) - BTS) - Raga-Shah had constructed a sixty foot tall statue of K�li, carved from solid jade. Ten thousand slaves died in its creation, and their blood and that of thousands of others was used to form the sacred pool surrounding the statue's marble base--a mote of blood allegedly turned to acid by K�li. (Savage Tales I#9 (fb) - BTS) - Raga-Shah imprisoned Sarapha and targeted her brother, Jakuna, for death. (Savage Tales I#9 (fb)) - Seven years later, Raga-Shah sent a group of Thugs to the African Dahomey Reserve to assassinate Jakuna Singh, and they murdered an entire Safari to do so. Shanna drove off the Thugs and found the wounded Singh, who instructed her to seek out his sister, Sarapha, in Calcutta. Shah then sent Damiru, the Bull of Daka-Jur, to finish his enemy. Damiru cast Shanna aside and slew Singh, vanishing into the jungle again afterwards. Shanna traveled to Calcutta and sought out Sarapha, finding instead an imposter who tried to kill her. The imposter used mystic means to end her own life after failing against Shanna. The She-Devil continued her search, taking a boat along the Ganges River, only to be struck down by loyal agents of Raga-Shah. Shanna was brought to the Temple of Daka-Jur and united with Sarapha, and Raga-Shah prepared to dump them both into the acid mote below his statue. Shanna got free, but after Raga-Shah easily swatted her away, she took Sarapha's advice and fled into the jungle. However, Raga-Shah then stole the spirits of Shanna's panthers, Ina and Biri and used them to animate an immense jade elephant, Ghamola, the Blood-Beast of Daka-Jur. (Savage Tales I#9) - Raga-Shah sent Ghamola after Shanna. While she was no match for its power, she did manage to leap atop its back and use her knife to pry out both of its eyes. Blinded, Ghamola rampaged through and demolished the Temple of Daka-Jur before falling into the acid mote. Raga-Shah was furious at the destruction of his life's work, and he swore revenge as a wall of flame rose up, separating he and Sarapha from Shanna. Only after he was gone did she realize that the destruction of Ghamola had caused the deaths of her beloved panthers. (Savage Tales I#10/3 - BTS) - Shanna pursued Raga-Shah to the Himalayan canyons, where he took refuge with King Aculdi. Shanna joined forces with Aculdi's nephew Telmah (rightful heir to the throne), but by the time she reached Aculdi's castle, Raga-Shah had already left. (Rampaging Hulk I#9/2 (fb) - BTS) - Shanna lost Raga-Shah's trail in the Himalayas. He relocated to San Pedro, California, where he established the Taj Mahal Mall, using its income to further his ultimate goal. (Rampaging Hulk I#9/2) - Shanna, who had coincidentally also relocated to San Pedro and was trying to move on with her, encountered Raga-Shah at his mall. She attacked him and he feigned ignorance, allowing the security guards to pull her off of him. However, he later sent a squad of assassins after her, and one of them managed to stab her with a drugged knife. They brought her to Raga-Shah, who cut her several times with his knife before preparing to slay her. However, at the last second she broke free, overpowered his agents, and then took one Raga-Shah himself. He wielded a long sword while she was unarmed, but her fury and desire for revenge allowed her to grab the sword by the blade, taking no heed as it cut into her fingers, and yank it from his grasp. She then knocked him out with a kick, took him back to her apartment, and fed him to her pet python, Ananta. Comments: Created by Carla & Gerry Conway and "The Tribe." Rampaging Hulk I#9 was by Steve Gerber and Tony DeZuniga. A Raga may be defined as a specified combination, decorated with Varnas (embellishments) and graceful consonances of notes within a Thaat (mode) which has the power of evoking a unique feeling distinct from all other joys and sorrows and which possesses something of a transcendental element. This esthetic feeling was termed by ancient pandits of musical science as Rasavadhana - a state completely unrelated to desire or fulfillment of desire; a feeling which is pure, self manifested, compounded of joy and consciousness, a sort of mystic experience. According to Webster's, the short version is that they are the very detailed melodic modes used in Classical Indian Music, traditionally being based on the Vedic philosophy of sound. A Shah is another name for a king, sovereign, or prince. Thuggee (from the Sanskrit root sthag (Pali, thak), to conceal, mainly applied to fraudulent concealment) was an Indian cult worshipping K�li whose members were known as Thugs. It was allegedly a hereditary cult with both Muslim and Hindu members that practiced large-scale robbery and murder of travelers by strangulation. Induction was typically passed from father to son, with the women of the household being kept ignorant of the cult activity. Ananta is named for the multi-headed Hindu God of Eternity. I don't find any information on Daka-Jur. I guess it was made up by the Conways. 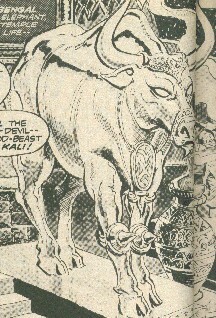 The Bull of Daka-Jur, it was a giant golden bull (twice normal size?) animated and sent after Jakuna Singh. Despite Shanna's efforts, it slew Jakuna and then escaped back into the jungle, returning to the Castle of Daka-Jur and an inanimate state. Presumably, like Ghamola, it took the spirit of a living being to animate Damiru. 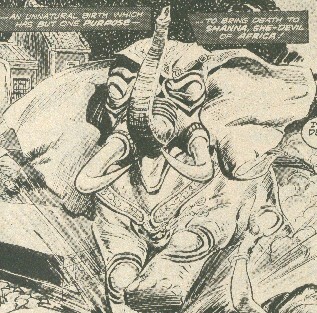 The Blood-Beast of Daka-Jur, it was a solid gold elephant animated by the spirits of Ina and Biri and sent after Shanna. She managed to jump on its back and pry out its eyes, blinding it and sending it on a rampage. It demolished the Temple of Daka-Jur before falling into the acid pit beneath Raga-Shah's K�li statue, which apparently consumed it. However, as it died, so did Ina and Biri. The sister of Jakuna Singh, she was seduced by Raga-Shah, and she promised to marry him. However, after learning his true goal in life she turned against him, and he imprisoned her. She was sentenced to die via Raga-Shah's acid mote, but while she was instead trapped alongside Raga-Shah after the temple's destruction. Her fate is unknown.